So far only Barclays has been accused of wrongdoing in the unfolding scandal. But shareholders now must add an arcane interest rate to an already long list of risks. That’s going to make it more difficult for JPMorgan, Citigroup and BofA to trade above book value any time soon. 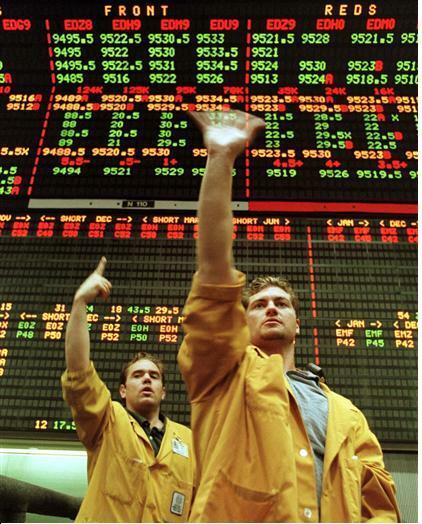 Clerks signal trades from the LIBOR (London InterBank Offered Rate) futures pit at the Chicago Mercantile Exchange. Stocks of JPMorgan, Citigroup and Bank of America were down between 2.8 percent and 4 percent in late afternoon trade on July 5, the day after former Barclays Chief Executive Bob Diamond told British lawmakers that his bank had been unfairly singled out in the Libor-rigging scandal. A panel of 16 banks set the dollar-denominated London Interbank Offered Rate - a benchmark interest rate that reflects the cost of borrowing between banks. U.S. banks JPMorgan, Citigroup and Bank of America contributed submissions in setting Libor.